TerraSil™ nanotechnology is a water soluble, UV and heat stable, reactive soil modifier with the ability to retain strength of road bases and resistance to deformation. SX100 nano silicone emulsion extends performance of Terrasil upto 100%. It is mixed with TerraSil™ solution and sprayed on compacted soils. Zycobond acrylic co-polymer emulsion bonds the soil particles to resist soil erosion in side shoulders and slopes. It is mixed with Terrasil solution for one step waterproofing and bonding of compacted soils. 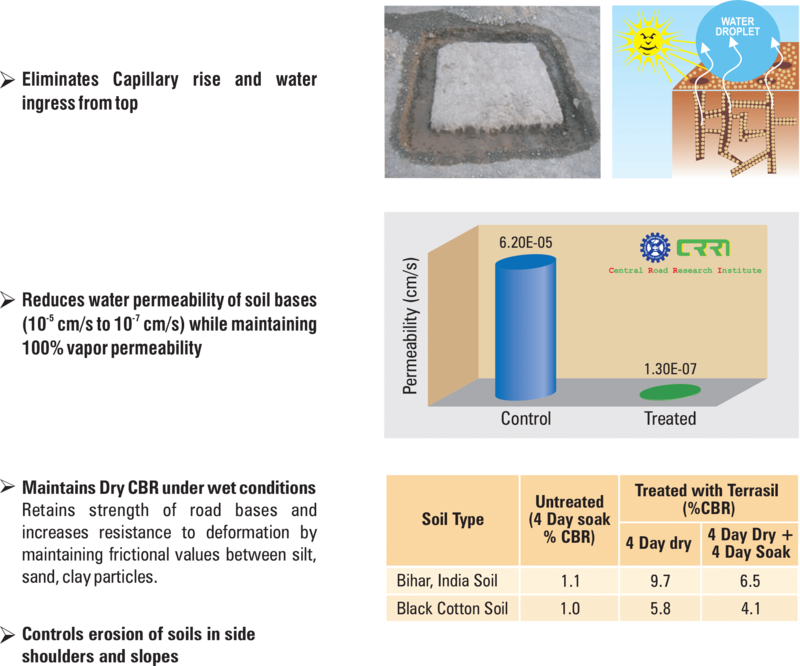 Apply Terrasil solution through two application cycles of Spray-Dry-Spray on compacted soil (Proctor Density above 95% at optimum moisture content). First spray cycle waterproofs almost 90 – 95% of the soil surface. Second spray cycle ensures 100% saturation of the soil surface, penetration and waterproofing of micro-cracks. Use regular soil to cover the treated slopes and build shoulders. For extra binding of the side slopes mix 10 kgs of Zycobond with Terrasil solution. Landfills / Construction Sites, Ponds, Canals, Levees (Bunds) etc. Terrasil should be stored between 5 45 °C (41 – 113 °F) in a shaded, dry area away from sunlight, heat, ignition, source of sparks, rain and standing water. The container lid should be securely fastened every time it is used. Its shelf life is 24 months.